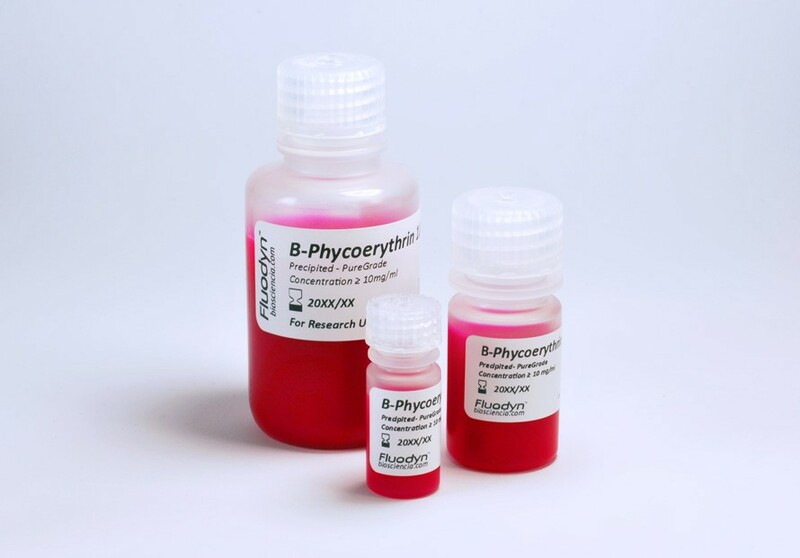 Fluodyn™ B-Phycoerythrin (B-PE) is a water-soluble ﬂuorescent pigment protein extracted from Porphyridium thanks to an innovative proccess developped by Biosciencia®. Thanks to its extremely high quantum yield, B-Phycoerythrin is the best choice for flow cytometry.It has the specificity to be low reactive toward non-targetted materials, conferring high selectivity abilities and low background generation.However, B-Phycoerythrin is sensitive to photobleaching and consequently not the best choice for fluorescent microscopy applications. B-Phycoerythrin is a part of the photosynthetic machinery of microalga and its structure optimizes the capture and transfer of light energy. When the individual molecules are puriﬁed and isolated, they become highly ﬂuorescent. Due to its high quantum yield and absorbance/ﬂuorescent properties, B-PE oﬀers a wide range of abilities as immunological assays, protein labelling and cell sorting. Labeling of macromolecules with B-PE can provide absorbance coeﬃcients 30-fold higher than with small synthetic ﬂuorophores. Fluodyn™B-Phycoerythrin is proposed under precipited or lyophilized form. Precipited form is provided with Quick Desalting System ready to use in few minutes. It can be conjugate with a wide range of molecules using standard reageant.